The U.S. Air Force Officer Training School (OTS) is located at Maxwell Air Force Base in Montgomery, Ala. 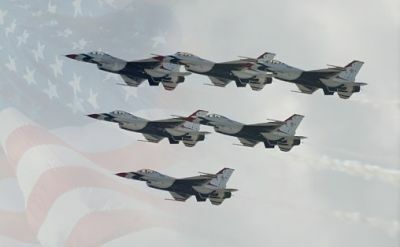 The nine-and-a-half-week program prepares potential commissioned officers of the Air Force to assume the responsibilities of an officer upon graduation. Attendance of OTS is limited to civilians and enlisted service members who have a four-year college degree. Air Force OTS is a nine-and-a-half-week course that develops future commissioned officers of the Air Force through an intense program based on academics, physical training, and personal and professional development. To be accepted into the program, candidates must pass the Air Force Qualifying Test, a physical and mental screening exam, and a selection board – all of which are designed to evaluate a candidate’s leadership potential, moral standards, and academic strength. Upon completion of Air Force OTS, graduates are commissioned at pay grade O-1 (Second Lieutenant). The first phase of Air Force OTS focuses on teamwork, discipline, and standardization with an emphasis on leadership fundamentals, military management, and Air Force culture. Building on the Indoctrination phase, the second phase focuses on learning Air Force history, basic combat skills, and the importance of cross-cultural competence in relation to the Air Force mission. As the name implies, phase three of OTS incorporates practical application of the knowledge gained during the first two phases. Candidates will have the opportunity to apply their leadership skills by training the new lower class and lead peers through officer trainee wing positions. Additionally, candidates will be required to pass leadership evaluations in order to advance to the next phase. Culminating in graduation from OTS, phase four focuses on mentorship and the transition into becoming an Air Force officer. Civilians applying to attend Air Force OTS must have a bachelor’s degree and be a U.S. citizen between the ages of 19-39 years old. To be accepted into the program, candidates must pass the Air Force Qualifying Test, a physical and mental screening exam, and a selection board. To apply, contact your nearest Air Force recruiter. Active duty, enlisted Airmen applying to attend OTS must have a bachelor’s degree and be a U.S. citizen between the ages of 19-39 years old. Enlisted personnel interested in attending OTS must have the approval of their unit commander. Learn more about Air Force Officer Training School.